From the Fifteenth to the Seventeenth Century. City in the Prussian province of Hesse-Nassau, Germany. The date of the organization of its Jewish community is uncertain. Probably no Jews were living in Frankfort at the time of the first and second Crusades, as the city is not mentioned among the places where Jews were persecuted, although references occur to persecutions in the neighboring cities of Mayence and Worms. A Jew of Frankfort is mentioned in connection with the sale of a house at Cologne between 1175 and 1191. Eliezer b. Nathan, rabbi at Mayence toward the end of the twelfth century, says that there were not then ten adult Jews in Frankfort. 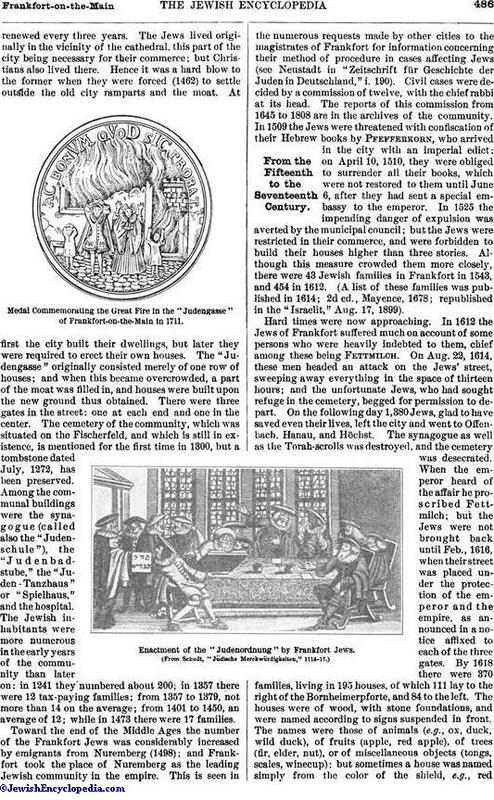 The first reliable information concerningFrankfort Jews dates from 1241, on May 24 of which year 180 Hebrews were killed during a riot and many fled, this being the first "Judenschlacht." As the affair was detrimental to the income of the emperor, he was incensed with the city for seven years, and King Conrad IV. did not forgive the citizens until May 6, 1246. The emperor distributed so liberally among the princes and his retainers the income he derived from the Jews that he had nothing left for himself; yet the Jews remained under his protection. In 1286 King Rudolf pledged to Count Adolf of Nassau 20 marks yearly from the income derived from the Frankfort Jews. When Adolf was made king under the title of "Adolf of Nassau," he pledged these 20 marks to the knight Gottfried of Merenberg (1292); and the latter again pledged 4 marks of this sum to the knight Heinrich of Sachsenhausen. King Adolf also gave 25 marks to Glottfried of Eppstein as a hereditary fief; and from 1297 he gave 300 marks yearly of the Jews' tax to the Archbishop of Mayence, adding to this sum 500 pounds of hellers in 1299. As early as 1303 the archbishop pledged 100 marks of this amount, and thus the Jews of the city of Frankfort became subject to the archbishop. The emperor, however, attempted to exact still more money from the Jews, and it was due only to the resistance of the city that King Adolf did not succeed in 1292 in obtaining from them the sum required for his coronation. The Jews were subject not only to the emperor and to the archbishop, but also to the city; in 1331 King Ludwig, recommended his "beloved Kammerknechte" to the protection of the municipality. Under Ludwig the Frankfort Jews were accused of a crime and cruelly persecuted, and many fled. The king then confiscated the houses and other property of the fugitives, and sold them to the municipal council for 3,000 pounds of hellers. Those that returned had their property restored to them; and, as the Jews had been treated unjustly, the king promised not to punish them again, but to be content with the verdict of the municipal council. The Jews were required, however, to pay to the king a new impost, the "goldene Opferpfennig." During the Black Death (1349) the Jews of Frankfort were again persecuted. At the beginning of these outbreaks the circumspect Carl IV., who feared for his income, pledged the Jews to the city for more than 15,000 pounds of hellers, stipulating that he would redeem them, which he never did. The Flagellants, on coming to Frankfort, destroyed nearly the entire community, the Jews in their distress setting fire to their own houses. Their property was confiscated by the council by way of indemnity. Jews returned to Frankfort very gradually. In 1354 Carl IV. renewed his pledge to the city; three years later the, Archbishop of Mayence again advanced his claims, but the Jews and the council came to an agreement with him in 1358. In 1367 the city was again in full possession of the income derived from the Jews, but this did not prevent the emperor from occasionally levying extraordinary taxes; for example, Sigismund (1414) exacted a contribution from the Jews toward the expenses of the Council of Constance. Plan of Frankfort-on-the-Main in 1552. Star Shows Position of Jewish Quarter. The Jews were under the jurisdiction of the municipal council. Beginning with 1488, privileges ("Judenstüttigkeiten") were issued that had to berenewed every three years. The Jews lived originally in the vicinity of the cathedral, this part of the city being necessary for their commerce; but Christians also lived there. Hence it was a hard blow to the former when they were forced (1462) to settle outside the old city ramparts and the moat. 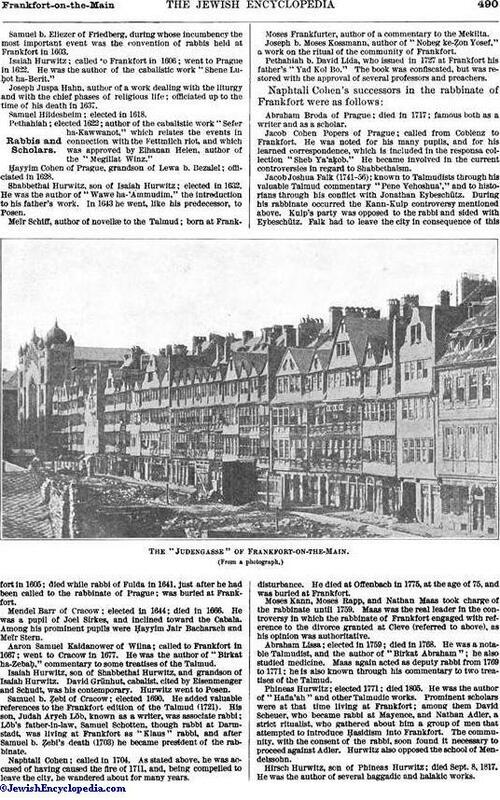 At first the city built their dwellings, but later they were required to erect their own houses, The "Judengasse" originally consisted merely of one row of houses; and when this became overcrowded, a part of the moat was filled in, and houses were built upon the new ground thus obtained. There were three gates in the street: one at each end and one in the center. The cemetery of the community, which was situated on the Fischerfeld, and which is still in existence, is mentioned for the first time in 1300, but a tombstone dated July, 1272, has been preserved. Among the communal buildings were the synagogue (called also the "Judenschule"), the "Judenbadstube," the "Juden-Tanzhaus" or "Spielhaus," and the hospital. The Jewish inhabitants were more numerous in the early years of the community than later on: in 1241 they numbered about 200; in 1357 there were 12 tax-paying families; from 1357 to 1379, not more than 14 on the average; from 1401 to 1450, an average of 12; while in 1473 there were 17 families. Medal Commemorating the Great Fire in the "Judengasse" of Frankfort-on-the-Main in 1711. Toward the end of the Middle Ages the number of the Frankfort Jews was considerably increased by emigrants from Nuremberg (1498); and Frankfort took the place of Nuremberg as the leading Jewish community in the empire. This is seen in the numerous requests made by other cities to the magistrates of Frankfort for information concerning their method of procedure in cases affecting Jews (see Neustadt in "Zeitschrift für Geschichte der Juden in Deutschland," i. 190). Civil cases were decided by a commission of twelve, with the chief rabbi at its head. The reports of this commission from 1645 to 1808 are in the archives of the community. In 1509 the Jews were threatened with confiscation of their Hebrew books by Pfefferkorn, who arrived in the city with an imperial edict; on April 10, 1510, they were obliged to surrender all their books, which were not restored to them until June 6, after they had sent a special embassy to the emperor. In 1525 the, impending danger of expulsion was averted by the municipal council; but the Jews were restricted in their commerce, and were forbidden to build their houses higher than three stories. Although this measure crowded them more closely, there were 43 Jewish families in Frankfort in 1543, and 454 in 1612. (A list of these families was published in 1614; 2d ed., Mayence, 1678; republished in the "Israelit," Aug. 17, 1899). Enactment of the "Judenordnung" by Frankfort Jews. Hard times were now approaching. In 1612 the Jews of Frankfort suffered much on account of some persons who were heavily indebted to them, chief among these being Fettmilch. On Aug. 22, 1614, these men headed an attack on the Jews' street, sweeping away everything in the space of thirteen hours; and the unfortunate Jews, who had sought refuge in the cemetery, begged for permission to depart. On the following day 1,380 Jews, glad to have saved even their lives, left the city and went to Offenbach, Hanau, and Höchst. The synagogue as well as the Torah-scrolls was destroyed, and the cemetery was desecrated. When the emperor heard of the affair he proscribed Fettmilch; but the Jews were not brought back until Feb., 1616, when their street was placed under the protection of the emperor and the empire, as announced in a notice affixed to each of the three gates. By 1618 there were 370 families, living in 195 houses, of which 111 lay to the right of the Bornheimerpforte, and 84 to the left. The houses were of wood, with stone foundations, and were named according to signs suspended in front. The names were those of animals (e.g., ox, duck, wild duck), of fruits (apple, red apple), of trees (fir, elder, nut), or of miscellaneous objects (tongs, scales, winecup); but sometimes a house was named simply from the color of the shield, e.g., red= "Rothschild"; black = "Schwarzschild," etc. The main synagogue was built in 1462; a smaller one was erected in 1603. Among the other communal buildings were the bath, to the east of the synagogue, the dance-house, the inn, the slaughterhouse, the bakehouse, and the hospital. With their return to Frankfort a new epoch in the history of the Jews of that city begins. They were still debarred from acquiring real estate, but they loaned money, even accepting manuscripts as pledges. The rate of interest, formerly as high as 24 per cent, was now reduced to 8 per cent. As the unredeemed pledges were sold, traffic in second-hand goods arose, which was further stimulated by the fact that the Jews were not permitted to sell new goods. They were also forbidden to deal in spices, provisions, weapons, cloth, and (from 1634) corn. But in spite of these interdictions their commerce gradually increased. 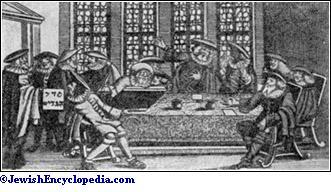 During the Thirty Years' war the Jews fared no worse than their neighbors. In 1694 there were 415 Jewish families; of these, 109 persons were engaged as money-lenders and dealers in second-hand goods; 106 dealt in dry-goods, clothes, and trimmings; 24 in spices and provisions; 9 retailed wine and beer; 3 were innkeepers; and 2 had restaurants. Besides these there were the communal officials. (After an old woodcut. )In the Eighteenth Century. Procession of Frankfort Jews in Honor of Archduke Leopold, May 17, 1716. 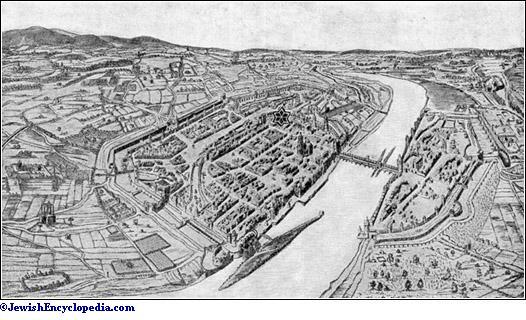 The importance and status of the community at the beginning of the eighteenth century are indicated by the gracious reception accorded to the deputation that offered presents to Joseph I. on his visit to Heidelberg in 1702. 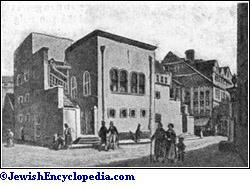 On Jan. 14, 1711, a fire which broke out in the house of Rabbi Naphtali Cohen destroyed the synagogue together with nearly the whole Judengasse. 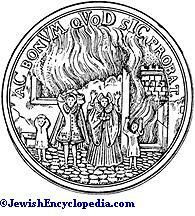 The rabbi was accused of having caused the fire by cabalistic means, and was forced to leave the city. The 8,000 homeless Jews found shelter either in the pest-house or with compassionate Christians. 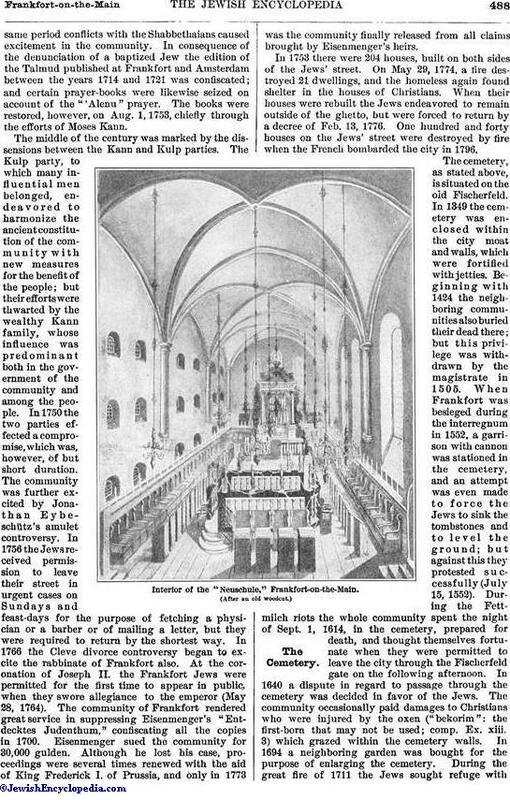 The synagogue and the dwelling-houses were speedily rebuilt, and the street was widened six feet. In 1715 the community issued an edict against luxury. From 1718 onward the "Residenten," or representatives of the community of Frankfort at Vienna, were accorded official recognition. In 1721 part of the Judengasse was again destroyed by fire. About thesame period conflicts with the Shabbethaians caused excitement in the community. In consequence of the denunciation of a baptized Jew the edition of the Talmud published at Frankfort and Amsterdam between the years 1714 and 1721 was confiscated; and certain prayer-books were likewise seized on account of the "`Alenu" prayer. The books were restored, however, on Aug. 1, 1753, chiefly through the efforts of Moses Kann. The middle of the century was marked by the dissensions between the Kann and Kulp parties. The Kulp party, to which many influential men belonged, endeavored to harmonize the ancient constitution of the community with new measures for the benefit of the people; but their efforts were thwarted by the wealthy Kann family, whose influence was predominant both in the government of the community and among the people. In 1750 the two parties effected a compromise, which was, however, of but short duration. The community was further excited by Jonathan Eybeschütz's amulet controversy. In 1756 the Jewsreceived permission to leave their street in urgent cases on Sundays and feast-days for the purpose of fetching a physician or a barber or of mailing a letter, but they were required to return by the shortest way. In 1766 the Cleve divorce controversy began to excite the rabbinate of Frankfort also. At the coronation of Joseph II. 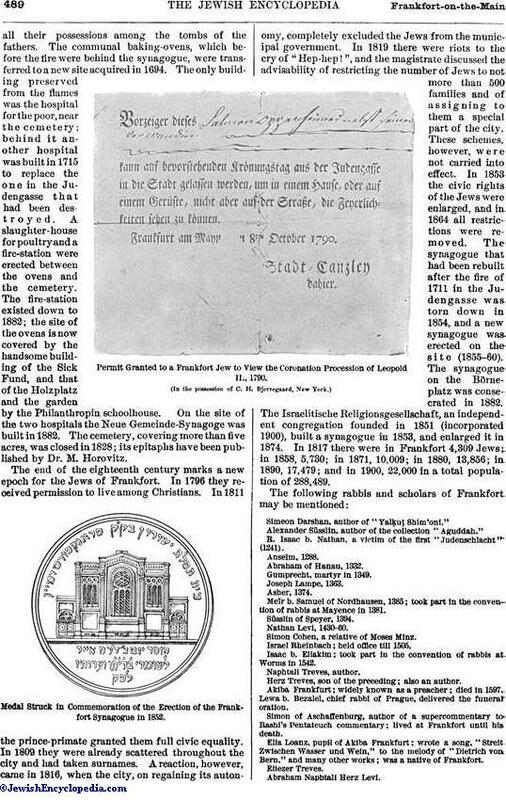 the Frankfort Jews were permitted for the first time to appear in public, when they swore allegiance to the emperor (May 28, 1764). The community of Frankfort rendered great service in suppressing Eisenmenger's "Entdecktes Judenthum," confiscating all the copies in 1700. Eisenmenger sued the community for 30,000 gulden. 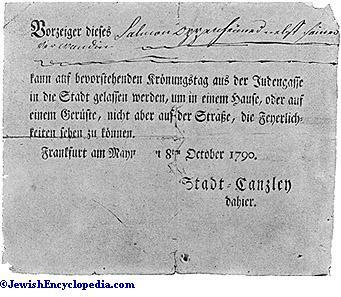 Although he lost his case, proceedings were several times renewed with the aid of King Frederick I. of Prussia, and only in 1773 was the community finally released from all claims brought by Eisenmenger's heirs. 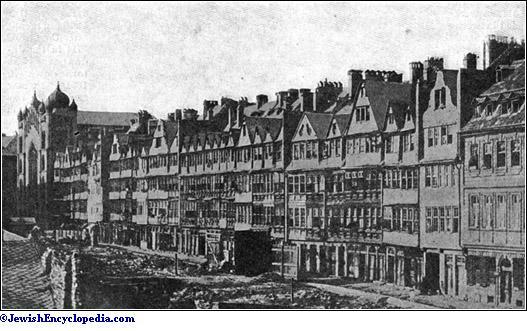 In 1753 there were 204 houses, built on both sides of the Jews' street. On May 29, 1774, a fire destroyed 21 dwellings, and the homeless again found shelter in the houses of Christians. 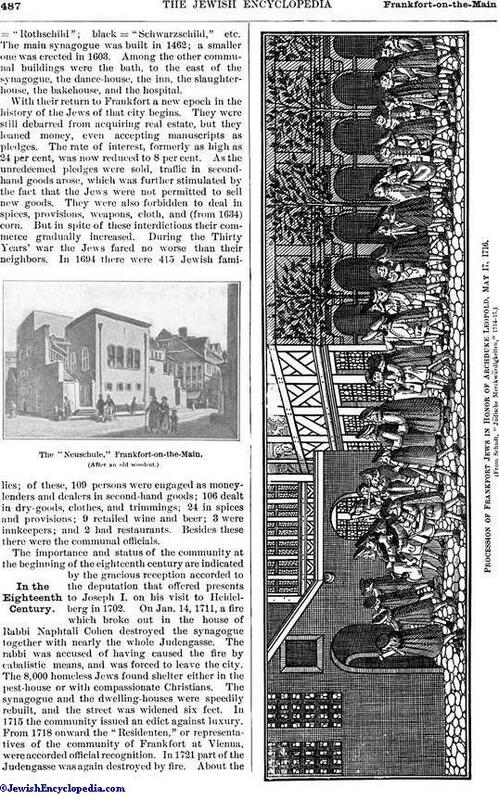 When their houses were rebuilt the Jews endeavored to remain outside of the ghetto, but were forced to return by a decree of Feb. 13, 1776. One hundred and forty houses on the Jews' street were destroyed by fire when the French bombarded the city in 1796. Interior of the "Neuschule," Frankfort-on-the-Main. The cemetery, as stated above, is situated on the old Fischerfeld. In 1349 the cemetery was enclosed within the city moat and walls, which were fortified with jetties. Beginning with 1424 the neighboring communities also buried their dead there; but this privilege was withdrawn by the magistrate in 1505. When Frankfort was besieged during the interregnum in 1552, a garrison with cannon was stationed in the cemetery, and an attempt was even made to force the Jews to sink the tombstones and to level the ground; but against this they protested successfully (July 15, 1552). During the Fettmilch riots the whole community spent the night of Sept. 1, 1614, in the cemetery, prepared for death, and thought themselves fortunate when they were permitted to leave the city through the Fischerfeld gate on the following afternoon. In 1640 a dispute in regard to passage through the cemetery was decided in favor of the Jews. The community occasionally paid damages to Christians who were injured by the oxen ("bekorim": the first-born that may not be used; comp. Ex. xiii. 3) which grazed within the cemetery walls. In 1694 a neighboring garden was bought for the purpose of enlarging the cemetery. During the great fire of 1711 the Jews sought refuge withall their possessions among the tombs of the fathers. The communal baking-ovens, which before the fire were behind the synagogue, were transferred to a new site acquired in 1694. The only building preserved from the flames was the hospital for the poor, near the cemetery; behind it another hospital was built in 1715 to replace the one in the Judengasse that had been destroyed. A slaughter-house for poultry and a fire-station were erected between the ovens and the cemetery. The fire-station existed down to 1882; the site of the ovens is now covered by the handsome building of the Sick Fund, and that of the Holzplatz and the garden by the Philanthropin schoolhouse. On the site of the two hospitals the Neue Gemeinde-Synagoge was built in 1882. The cemetery, covering more than five acres, was closed in 1828; its epitaphs have been published by Dr. M. Horovitz. The end of the eighteenth century marks a new epoch for the Jews of Frankfort. In 1796 they received permission to live among Christians. In 1811 the prince-primate granted them full civic equality. In 1809 they were already scattered throughout the city and had taken surnames. A reaction, however, came in 1816, when the city, on regaining its autonomy, completely excluded the Jews from the municipal government. In 1819 there were riots to the cry of "Hep-hep! ", and the magistrate discussed the advisability of restricting the number of Jews to not more than 500 families and of assigning to them a special part of the city. These schemes, however, were, not carried into effect. In 1853 the civic rights of the Jews were enlarged, and in 1864 all restrictions were removed. 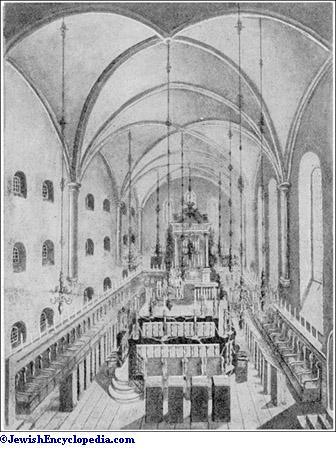 The synagogue that had been rebuilt after the fire of 1711 in the Judengasse was torn down in 1854, and a new synagogue was erected on the site (1855-60). The synagogue on the Börneplatz was consecrated in 1882. 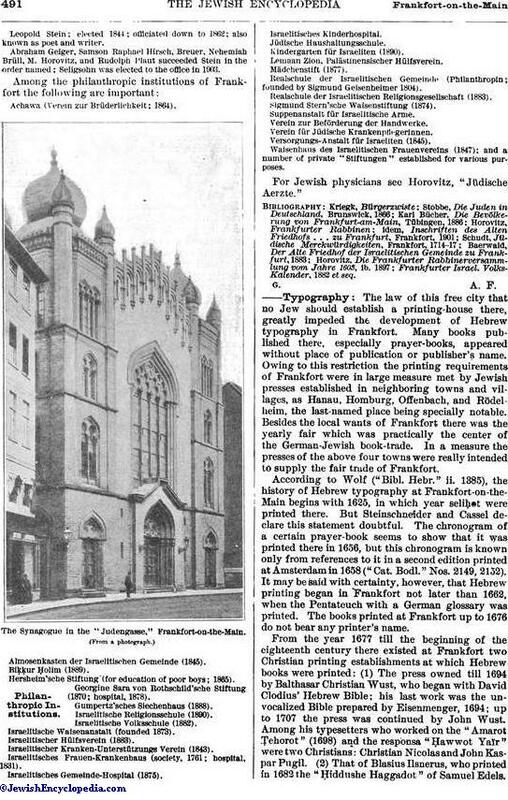 The Israelitische Religionsgesellschaft, an independent congregation founded in 1851 (incorporated 1900), built a synagogue in 1853, and enlarged it in 1874. In 1817 there were in Frankfort 4,309 Jews; in 1858, 5,730; in 1871, 10,009; in 1880, 13,856; in 1890, 17,479; and in 1900, 22,000 in a total population of 288,489. 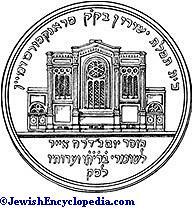 Medal Struck in Commemoration of the Erection of the Frankfort Synagogue in 1852. Permit Granted to a Frankfort Jew to View the Coronation Procession of Leopold II., 1790. Simeon Darshan, author of "Yalḳuṭ Shim'oni." Alexander Süsslin, author of the collection "Aguddah." R. Isaac b. Nathan, a victim of the first "Judenschlacht" (1241). Meïr b. Samuel of Nordhausen, 1385; took part in the convention of rabbis at Mayence in 1381. Simon Cohen, a relative of Moses Minz. Israel Rheinbach; held office till 1505. Isaac b. Eliakim; took part in the convention of rabbis at, Worms in 1542. Herz Treves, son of the preceding; also an author. Akiba Frankfurt; widely known as a preacher; died in 1597. Lewa b. Bezalel, chief rabbi of Prague, delivered the funeral oration. Simon of Aschaffenburg, author of a supercommentary to Rashi's Pentateuch commentary; lived at Frankfort until his death. Elia Loanz, pupil of Akiba Frankfurt; wrote a song, "Streit Zwischen Wasser und Wein," to the melody of "Dietrich von Bern," and many other works; was a native of Frankfort. Samuel b. Eliezer of Friedberg, during whose incumbency the most important event was the convention of rabbis held at Frankfort in 1603. Isaiah Hurwitz; called +O Frankfort in 1606; went to Prague in 1622. He was the author of the cabalistic work "Shene Luḥot ha-Berit." Joseph Juspa Hahn, author of a work dealing with the liturgy and with the chief phases of religious life; officiated up to the time of his death in 1637. Samuel Hildesheim; elected in 1618. Pethahiah; elected 1622; author of the cabalistic work "Sefer ha-Kawwanot," which relates the events in connection with the Fettmilch riot, and which was approved by Elhanan Helen, author of the "Megillat Winz." Ḥayyim Cohen of Prague, grandson of Lewa b. Bezalel; officiated in 1628. Shabbethai Hurwitz, son of Isaiah Hurwitz; elected in 1632. He was the author of "Wawe ha-'Ammudim," the introduction to his father's work. In 1643 he went, like his predecessor, to Posen. Meïr Schiff, author of novellæ to the Talmud; born at Frankfort in 1605; died while rabbi of Fulda in 1641, just after he had been called to the rabbinate of Prague; was buried at Frankfort. Mendel Barr of Cracow; elected in 1644; died in 1666. He was a pupil of Joel Sirkes, and inclined toward the Cabala. Among his prominent pupils were Ḥayyim Jair Bacharach and Meïr Stern. Aaron Samuel Kaidanower of Wilna; called to Frankfort in 1667; went to Cracow in 1677. He was the author of "Birkat ha-Zebaḥ," commentary to some treatises of the Talmud. Isaiah Hurwitz, son of Shabbethai Hurwitz, and grandson of Isaiah Hurwitz. David Grünhut, cabalist, cited by Eisenmenger and Schudt, was his contemporary. Hurwitz went to Posen. Samuel b. Ẓebi of Cracow; elected 1690. He added valuable references to the Frankfort edition of the Talmud (1721). His son, Judah Aryeh Löb, known as a writer, was associate rabbi; Löb's father-in-law, Samuel Schotten, though rabbi at Darmstadt, was living at Frankfort as "Klaus" rabbi, and after Samuel b. Ẓebi's death (1703) he became president of the rabbinate. Naphtali Cohen; called in 1704. As stated above, he was accused of having caused the fire of 1711, and, being compelled to leave the city, he wandered about for many years. Moses Frankfurter, author of a commentary to the Mekilta. Joseph b. Moses Kossmann, author of "Noheg ke-Ẓon Yosef," a work on the ritual of the community of Frankfort. Pethahiah b. David Lida, who issued in 1727 at Frankfort his father's "Yad Kol Bo." The book was confiscated, but was restored with the approval of several professors and preachers. Abraham Broda of Prague; died in 1717; famous both as a writer and as a scholar. 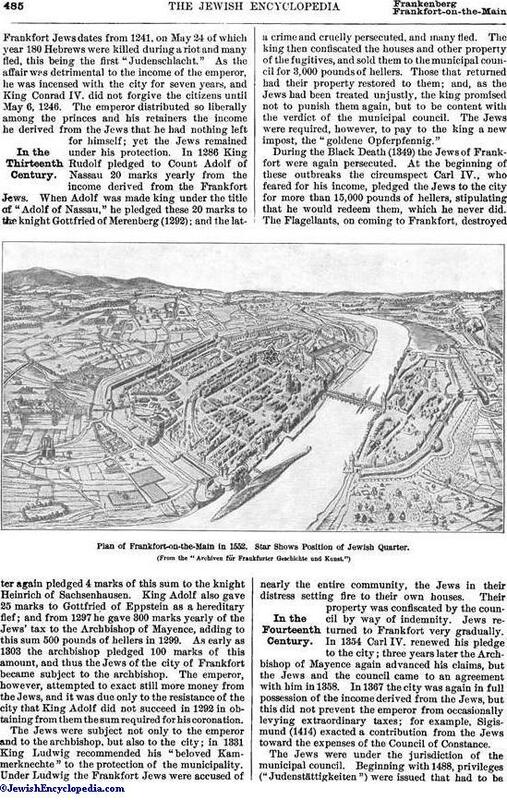 Jacob Cohen Popers of Prague; called from Coblenz to Frankfort. He was noted for his many pupils, and for his learned correspondence, which is included in the responsa collection "Sheb Ya'aḳob." He became involved in the current controversies in regard to Shabbethaism. Jacob Joshua Falk (1741-56); known to Talmudists through his valuable Talmud commentary "Pene Yehoshua'," and to historians through his conflict with Jonathan Eybeschütz. During his rabbinate occurred the Kann-Kulp controversy mentioned above. Kulp's party was opposed to the rabbi and sided with Eybeschütz. Falk had to leave the city in consequence of this disturbance. He died at Offenbach in 1775, at the age of 75, and was buried at Frankfort. Moses Kann, Moses Rapp, and Nathan Maas took charge of the rabbinate until 1759. Maas was the real leader in the controversy in which the rabbinate of Frankfort engaged with reference to the divorce granted at Cleve (referred to above), as his opinion was authoritative. Abraham Lissa; elected in 1759; died in 1768. He was a notable Talmudist, and the author of "Birkat Abraham"; he also studied medicine. Maas again acted as deputy rabbi from 1769 to 1771; he is also known through his commentary to two treatises of the Talmud. Phineas Hurwitz; elected 1771; died 1805. He was the author of "Hafla'ah" and other Talmudic works. Prominent scholars were at that time living at Frankfort; among them David Scheuer, who became rabbi at Mayence, and Nathan Adler, a strict ritualist, who gathered about him a group of men that attempted to introduce Ḥasidism into Frankfort. The community, with the consent of the rabbi, soon found it necessary to proceed against Adler. Hurwitz also opposed the school of Mendelssohn. Hirsch Hurwitz, son of Phines Hurwitz; died Sept. 8, 1817. He was the author of several haggadic and halakick works. Leopold Stein; elected 1844; officiated down to 1862; also known as poet and writer. Abraham Geiger, Samson Raphael Hirsch, Breuer, Nehemiah Brüll, M. Horovitz, and Rudolph Plaut succeeded Stein in the order named; Seligsohn was elected to the office in 1903. Achawa (Verein zur Brüderlichkeit; 1864). The Synagogue in the "Judengasse," Frankfort-on-the-Main. Almosenkasten der Israelitischen Gemeinde (1845). Hersheim'sche Stiftung (for education of poor boys; 1865). Georgine Sara von Rothschild'sche Stiftung (1870; hospital, 1878). Israelitisches Frauen-Krankenhaus (society, 1761; hospital, 1831). Realschule der Israelitischen Gemeinde (Philanthropin; founded by Sigmund Geisenheimer 1804). Realschule der Israelitischen Religionsgesellschaft (1883). Verein zur Beförderung der Handwerke. Waisenhaus des Israelitischen Frauenvereins (1847); and a number of private "Stiftungen" established for various purposes. For Jewish physicians see Horovitz, "Jüdische Aerzte." Frankfurter Israel. Volks-Kalender, 1882 et seq. The law of this free city that no Jew should establish a printing-house there, greatly impeded the development of Hebrew typography in Frankfort. Many books published there, especially prayer-books, appeared without place of publication or publisher's name. Owing to this restriction the printing requirements of Frankfort were in large measure met by Jewish presses established in neighboring towns and villages, as Hanau, Homburg, Offenbach, and Rödelheim, the last-named place being specially notable. Besides the local wants of Frankfort there was the yearly fair which was practically the center of the German-Jewish book-trade. In a measure the presses of the above four towns were really intended to supply the fair trade of Frankfort. According to Wolf ("Bibl. Hebr." ii. 1385), the history of Hebrew typography at Frankfort-on-the-Main begins with 1625, in which year seliḥot were printed there. But Steinschneider and Cassel declare this statement doubtful. The chronogram of a certain prayer-book seems to show that it was printed there in 1656, but this chronogram is known only from references to it in a second edition printed at Amsterdam in 1658 ("Cat. Bodl." Nos. 2149, 2152). It may be said with certainty, however, that Hebrew printing began in Frankfort not later than 1662, when the Pentateuch with a German glossary was printed. The books printed at Frankfort up to 1676 do not bear any printer's name. 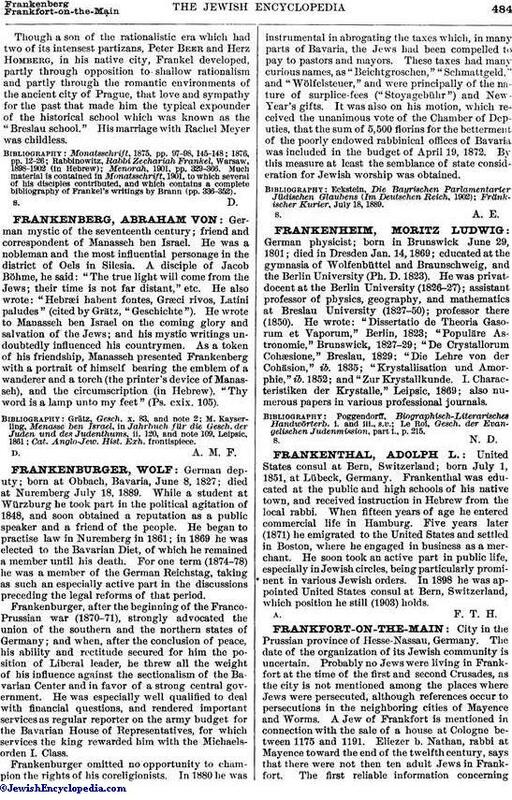 From the year 1677 till the beginning of the eighteenth century there existed at Frankfort two Christian printing establishments at which Hebrew books were printed: (1) The press owned till 1694 by Balthasar Christian Wust, who began with David Clodius' Hebrew Bible; his last work was the unvocalized Bible prepared by Eisenmenger, 1694; up to 1707 the press was continued by John Wust. Among his typesetters who worked on the "Amarot Ṭehorot" (1698) and the responsa "Ḥawwot Yaïr" were two Christians: Christian Nicolas and John Kaspar Pugil. (2) That of Blasius Ilsnerus, who printed in 1682 the "Ḥiddushe Haggadot" of Samuel Edels.Many works which appeared in the last quarter of the seventeenth century without bearing the names of either printers or publishers belong probably to the publications of Isaac and Seligmann, sons of Hirz Reis, who published in 1687 a beautiful edition of the Yalḳuṭ. But though the proprietors of the presses were Christians, the publishers were often Jews; among them may be mentioned Joseph Trier Cohen (1690-1715), Leser Schuch, Solomon Hanau, and Solomon and Abraham, sons of Kalman, who in 1699 published through John Wust the Alfasi in three volumes. But the most flourishing period in the history of Hebrew typography in Frankfort was the first quarter of the eighteenth century. Hebrew books were printed in several establishments, including those of Mat. Andrea (1707-10), Jo. Ph. Andrea (1716), Nicolas Weinmann (1709), Antony Heinscheit (1711-19), and, above all, John Kölner, who during the twenty years of his activity (1708-27) furnished half of the Hebrew works printed at Frankfort up to the middle of the nineteenth century. Among the more important works printed by Kölner may be mentioned the "Bayit Ḥadash," in 5 vols., corrected by Samuel Dresles (1712-16), and the continuation of the Babylonian Talmud (1720-23) begun at Amsterdam, between which city and Frankfort there was a sort of partnership in printing. Kölner printed with the same Amsterdam type the "Yeshu'ah be-Yisrael" (1719-20). He then conceived the idea of printing the Alfasi after the model of the Sabbionetta edition of 1554, a copy of which was bought for 40 thalers. He resolved upon printing 1,700 copies at the price of 10 thalers each; the expenses, 11,000 thalers, were to have been obtained by means of a lottery; that is to say, each subscriber was entitled to a copy of the book and to a lottery ticket; but the whole plan miscarried. Between the years 1726 and 1736 no Hebrew printing appears to have been done in Frankfort, and during the last three-quarters of the eighteenth century very few Hebrew works were printed there. Among these were: "Toledot Adam," a Hebrew letter-writer printed in 1736; and in 1742 the responsa "Sheb Ya'aḳob," the three Babot of the Jerusalem Talmud, and the second part of the "Pene Yehoshua'," the third part appearing in 1756. 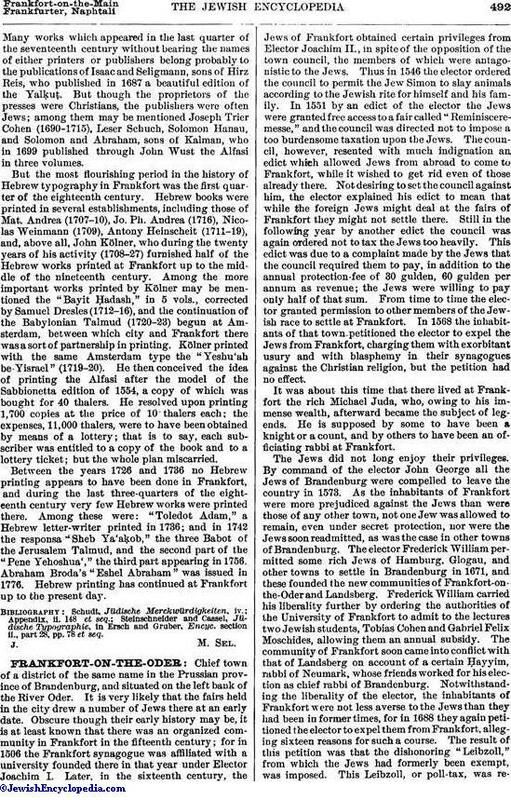 Abraham Broda's "Eshel Abraham" was issued in 1776. Hebrew printing has continued at Frankfort up to the present day. Steinschneider and Cassel, Jüdische Typographie, in Ersch and Gruber, Encyc. section ii., part 28, pp. 78 et seq.